both Organic Farming and Natural Farming. potential and value of products grown by Natural Farming. 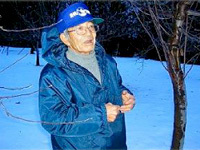 information and knowledge about the benefits of Natural Farming. Farmers can harvest high quality vegetables and grains without the use of fertilizer and pesticide, and still have a steady income. And because of this, consumers can eat safe vegetables and grain etc. It seems like a dream, but it isn't. It is the reality of Natural Farming. 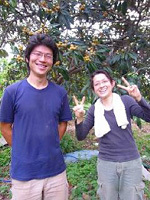 *Natural Farming is not farming based on non-interference cultivation techniques. *The definition of fertilizer is based on the Fertilizer Control Act. In the early 1970’s, the books "Multiple contamination" by Sawako Ariyoshi and "Silent Spring" by Rachel Carson was published. These had a definite effect on people and the number of farmers who practiced organic farming or environmental conservation farming increased. However, at the time, they were labeled "eccentrics" and excluded from the community. For a long time they endured hardships and discrimination from their peers. But times changed, and farming methods focusing on preserving the environment got more and more attention. 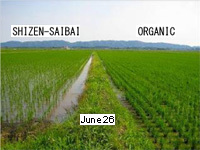 In Japan, the JAS standard for organic vegetables was enacted in 2001, and "Act for the promotion of organic farming " in 2006. Concepts and words such as "organic" or "natural food" are now widely recognized throughout the world, and are spearheading this new trend. However, even in farming where no chemical fertilizers are used some problems can be observed. Some of these are caused by an excessive use of (organic) fertilizer. Taking this problem into consideration as well we would like to introduce "Natural Farming”. Most people wonder if Natural Farming really can provide the world’s increasing population with a sufficient food supply. In fact, farmland cultivated by Natural Farming is expected to be permanently fertile, so securing a sufficient supply of food is not a problem. That is why we can recommend Natural Farming as a method where farming as a profession is practically feasible, not just for self-sufficiency or to live a simple lifestyle. Why is excessive use of organic fertilizer not good? Manure from animals like cattle or poultry is called animal fertilizer. Animal fertilizer, especially cattle manure, accounts for most organic use. Cattle eat mainly concentrated feed of imported corn which is high in calories, and most of this imported corn is contaminated in post-harvest processing or genetically modified. Additionally, at the breeding stage the cattle are given antibiotics, hormone drugs etc. Is it really possible to say that the crops grown with this fertilizer are safe to eat? (It is currently tolerated under the Organic JAS law) Can we really preserve a clean soil by continuing to use this fertilizer? If you use too much fertilizer, the plants will not digest all of the nitrogen. Nitrogen is an important ingredient in amino acids that helps the plant grow. Amino acids are basic ingredients of protein, but if the plant absorbs too much nitrogen the photosynthetic process can’t keep up with nitrogen digestion. As a result of this the undigested nitrogen turns into nitric acid. These nitrous acids (the same additives that are used in dye) reacts chemically with secondary amine inside the body (mouth), and may produce a cancer causing nitrosamine. This was discovered in the 1960's, but has never been widely known. When you observe cows which eat concentrated feed and graze on fields you can see that they don't eat the excessive nitrogen grass which grows where they have excreted. It is also said that vegetables and water which contain a significant amount of nitric acid can cause blue baby syndrome or diabetes. Among the people who desire food made without fertilizer there are many who are allergic to not just agrochemicals but organic fertilizer as well. It’s hard to say exactly what substance that causes the allergic reaction, but the fact that they can safely eat no-fertilizer products tells us that there is a possibility that there are certain problems with crops that contain an excessive amount of nitrogen. Additionally, too much fertilizer can cause nitrogen (nitrate nitrogen) to contaminate the groundwater. This problem went into the headlines of industry newspapers over 15 years ago. There are many places in Japan where the inhabitants have become unable to drink the tap water because of nitrogen amounts exceeding the safety standards, and it takes many years to fix the problem. At the time when this caught the eyes of the public it was already to late in many areas as well. And a problem just as serious as water pollution and blue baby syndrome etc. is the problem of salt accumulation in the soil throughout the world, leading to barren and exhausted land. And Japan also follows this wrong track! 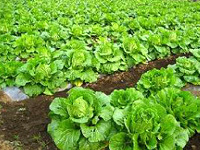 Japan heavily depends on imports for fertilizer of vegetable origin. 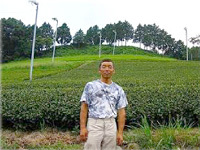 And Japanese agriculture can hardy be said to be very sustainable, as it spends large amounts of energy on import and transport of fertilizer, and emits large quantities of carbon dioxide. The same can be said for imported feed which makes animal fertilizer. But even if farmers across the nation decided to produce compost themselves, there would be a shortage of grass or fallen leaves. For these reasons, we think that agriculture that uses large amounts of organic fertilizer is non-sustainable, and that it puts a burden on both the environment and the people. There is an increasing amount of farmers who are aware of this fact, and they make efforts to reduce the use of organic fertilizer. We often hear from these farmers that crop damage from diseases and harmful insects decreases, and that farming becomes easier. You may be surprised to know that using fertilizers can cause disease and insect damage. However, less disease and insect damage is a proof that the soil is strong, and that crops are growing naturally as they originally were supposed to (we will discuss this topic in detail later.) To put it another way, harmful diseases and insect are attracted to vulnerable crops. So, if it is possible to cultivate crops without fertilizer, we believe that it is natural that both conventional and organic farming switches to Natural Farming. 6.Japan is the #1 country using pesticide! Japan is actually the biggest user of pesticide in the world (1.6kg/10a on a weight basis) The mass media often tell us that vegetables grown in China are dangerous, but there are actually 280 times more fields that don’t use pesticide in China than in Japan. So why do Japanese farmers use a lot of pesticide? Well, of course, they are doing it to please the distributors and consumers. But the farmers actually want to use as little agrochemicals as possible. This is because agrochemicals are expensive, as well as being bad for the farmers' health. In addition, not only agrochemicals, but also chemical fertilizers weaken crops. And if you consider the energy spent on imports, the Japanese self-sufficiency ratio for chemical fertilizer is close to zero. Crops grow can well without fertilizer! In simple terms, farmers have to fully focus on the power of the soil and the vitality of the crops. It is important to use conventional farming techniques such as: proper timing when planting, potting compost, plowing methods, breeding methods and settled planting techniques, weeding, controlling soil temperature and humidity and dryness, selecting proper seeds suited to the land, self-seed production, pruning technique, and creating suitable environments for each crop. But Natural Farmers need even more knowledge, and need to develop even more advanced techniques than these. Natural Farming doesn't just mean that farmers don't use fertilizer and pesticide. It is based on respect for nature, adopting nature itself as a model, and adapting to its needs. Farmers need to to observe the surrounding environment, and actively investigate and make sure of the qualities of lands and crops, as well as climate. "Do you know what kind of weeds there are in your fields?" "What kinds of changes to the crops do you see happening compared to last year?" You’ll be surprised how many farmers there are who can’t answer these questions. Don’t they know what’s going on in their own fields? In conventional farming, farmers don't really need observation skills as long as they use agrochemicals and stick to the normal routine of picking the same seeds as always, planting them, and spreading pesticide and fertilizers. Because of this fields become simple crop factories, and the observation skills which are very important for farmers under ordinary circumstances become lost. We also have to particularly focus on the “seed". A seed called F1 (Filial 1 Hybrid) is widely used in Japan, and nearly 90% of it is imported from abroad. We have to ask ourselves if these seeds imported from far-away countries really can adapt quickly to the Japanese climate. If it’s hard for the seeds to adapt, the farmers have no choice but to rely heavily on pesticides and fertilizers. However, if farmers choose pure bred seeds that suit themselves and the soil, and continue harvesting their own seeds they will be able to produce unique seeds that are perfectly suited to the soil and climate. This may take take years and even decades, but it’s well worth the effort. Pure bred seeds contain various genes and can therefore be used in many regions. In many cases collecting seeds requires both time and effort. However, seeing how the plants adapt to the region while improving both harvesting amounts and crop quality makes the struggle more than worthwhile. Developing and harvesting your own seeds is a very important part of Natural Farming. However, this ideal is far from the current situation. Today, 5 major biotechnology companies continue to buy out seed companies all over the world. 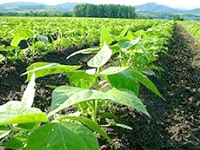 In neighboring South Korea, all major seed companies were bought by foreign companies. A technology called male infertility is the very latest in F1 seed technology, and on purpose, this creates plants with pollination inability and deformed stems. Equivalent to the condition azoospermia in humans. We are told that among the onions that are sold today all are made from one out of five lineage genes with male sterility. Most onions grown around the world give off no pollen. If all plants end up being unable to produce new seeds, they naturally have to be bought. This is the strategy of the seed companies, a strategy that has started to rob us of sustainable agriculture. 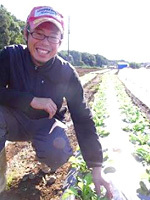 In Japan, male infertile carrot, corn, long green onion, cabbage, radish, white turnip, chinese cabbage, and beet are being grown more and more every day. Fertilizers which have been applied since ancient times accumulate in the soil surface (sometimes in layers), and remaining nitrogen hinder roots from spreading, and cools the soil. It is important to remove this nitrogen. However, some farmers believe that the nitrogen in the soil makes the crops less susceptible to disease and harmful insects. In fact, at the time we have no means of shedding more light on this, but we think it’s very interesting that there are still things we don’t fully understand in modern agriculture. It’s generally believed that crops are more susceptible to disease and harmful insect when they contain a lot of sugar. But we know now that the chances of this increases with the amount soluble nitrogen and phosphoric acid compounds inside the plants. Of course, crops need a certain amount of nitrogen in order to grow, and it’s natural to think that you sometimes need to apply artificial nitrogen to the crops. However, in the soil you find a bacteria called Rhizobium which can help fixate the nitrogen. As Rhizobium exists in the rizosphere in a specific type of plants, you can not find it everywhere. The nitrogen amount after using normal chemical nitrogen fertilizer is 60.2kg/ha. But in cases where Rhizobium and other Fabaceae plants are properly used the nitrogen fixation ability is equal to 66.7kg/ha. Another one is a soil bacteria called azotobacter. Nitrifying bacteria like this exists independently in the soil. 80% of these are killed if exposed to soil fumigants, but if no agrochemicals are used, these microorganisms and small animals can have as much as a 50~280kg/ha nitrogen fixation ability. Humus has a nitrogen content of 5%. For example, if the soil has 4% of humus, and there is 90t of organic material in the surface layer, it’s possible to calculate that the soil has 4500kg/ha of nitrogen stored. Based on the above fact, we don't worry about the amount of nitrogen at all. Or more precisely, it doesn't stand to reason that we waste such a large amount of nitrogen. From seeding period to settled plant period, from vegetative to generative growth stage, from blooming to bearing fruit, with each period a plant’s physiology changes. 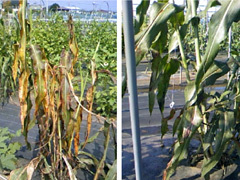 In addition, climate change makes the plant more susceptible to disease and insect damage. When it comes to disease and insect damage, the most important thing is to look for the underlying causes from many different angles, such as seasons, soil, seeds, and cultivation management. However, we often hear from farmers who continue Natural Farming and seed production that disease and insect damage problems subside over time. When you cultivate crops which don't suit the land, and at wrong period, it becomes necessary to use agrochemicals and chemical fertilizers. You also need the skill of grafting. But with Natural Farming your number one priority is suitability to the land and crops, and you do your best to avoid farming that opposes the natural balance of the surrounding environment. Forest trees don't get their energy from artificial fertilizer. Of course, in the forest you have fallen leaves, but what about roadside trees? As people tend to rake the leaves the roadside trees don’t get much organic matter. But nevertheless, these roadside trees grow very well. Just like the trees you may have in your garden. Giraffes, zebras, and elephants are herbivores. Modern nutritional science claims that these animals have eating habits that lead to protein deficiency and malnutrition. Despite this, they are all great and powerfully built. The chicken egg is also a popular example. Chickens who are given feed which has almost no calcium still lay eggs as normal. From a nutritional standpoint, as eggshells are made of calcium carbonate, a chicken would need large amounts of calcium. Where do the chickens get this calcium from? It seems that even modern science has yet to solve with mystery. Through contemporary science, we can’t prove that crops grow well by only using Natural Farming. 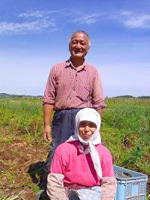 However, all over Japan there are examples of farmers who reap good harvests with this method. If all things that people can't explain with science are denied, the processes behind these mysterious phenomena may never be discovered. Earth, rain, air, and sun provide endless nutrients. Plants absorb these when needed it and uses them to grow stronger. This is the natural state of plants. We feel that this basic natural power is being ignored in modern society. Plants are much stronger than we think and they are a highly advanced type of organism. 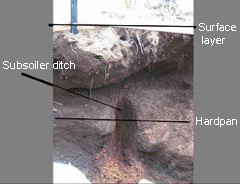 The "Hardpan" is hardened soil. Not only in Natural Farming, but in all methods that don't apply herbicide, anti-weed measures and weeding are probably the most tiresome tasks. But it’s important to not just blindly think of weeds as an enemy. You might say that understanding the meaning of it’s existence and dealing with them accordingly is the key to increased crop yields and improved quality of the crops. It is said that the origin of weeds started 10,000 or 15,000 years ago when the last glacial period ended. A weed is basically an annual plant. These plant passes the winter as seeds. The root tills the soil, and by leaving behind organic materials microorganisms flourish. The number of small animals increases, and the soil becomes rich. Weeds really have the power to transform barren land into good and vital soil. Above all, the role of weeds in a farm land ecosystem is to make the soil soft and warm and provide proper humidity. In the end, if the soil becomes good enough it may not need to grow weeds anymore. In short, hard and cold soil need weeds. Gramineous weeds grow in hard soil to break them. Leguminous weeds grow to accelerate the structure aggregation. Purslanes like prefer dry soil. But even in times of drought we hear that crops that grow near purslanes don't suffer that badly from drought. How much you need to manage weeds depends on the crops and soil environment. For example, many people complain to the seed store that the carrot seeds they planted never sprout. The fact is, for carrot seeds to to come out, you need to provide plenty of moisture and weed thoroughly. On the other hand, in the case of fruit trees non-tilled farming is also possible. Weeds are a valuable asset, but it is very important to manage them properly in order to produce crop yields big enough to support people. Remove weeds if needed, and in other cases use their abilities by not removing them. Above all, we need to understand and properly manage weeds. In Natural Farming, it’s also important to put focus on "drainage". Good drainage means that the aggregate structure is good and that there are few hardpans. It is important to guarantee soil temperature, water retention ability (humidity), drainage ability (dryness). However, some crops require considerable water and some crops don't, so they should be treated accordingly. Sometimes green manure is needed. The number one reason for giving green manure is to break up hardpans and secure drainage. This does not mean however that a soil with no hardpans is good. 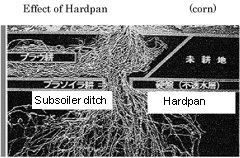 If there are no hardpans, the soil cannot maintain humidity. What farmers need to remove is the extra hardpans created by fertilizer use. If farmers make well-drained soil, it it possible to farm without tilling. However, it seems to be impossible to get enough harvest for an entire population using just this technique. Microorganisms gather around plant roots. The number of microorganism witihin a 1mm radius of the root (the rizosphere) is 500 times higher than another area (non-rhizosphere). When you compare the roots of plants from fertilized areas and non-fertilized areas you can find a significant difference in number of actual roots. In fact, with Natural Farming the amount of microorganisms, organic acid (from roots), and organic matter (including root cap) is very different from conventional farming. Therefore, it is impossible to think of conventional and Nature Farming the same way. Is there a need to replenish minerals taken from soil by repeated cultivation? We know that there is enough nutrition in the soil to be used over the next 100 to 10,000 years, and enough phosphoric acid for 20,000 years. 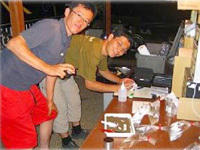 (the author developed this soil analysis when I was a university student. My graduation thesis was "Comparison of natural ecosystem, when farmers cultivate rice with "Natural Farming", "organic cultivation", or "conventional farming") In apple cultivation, we hear reports that there is a 13,000 year supply of phosphoric acid, and 4,500 years of potassium in the soil. However, as this doesn’t mean that all this nutrition is in a form that plants can absorb, conventional soil testing often give results of nutritional deficiency. Interestingly, the data from soil analysis conducted in the previous decades shows the same data as recent days. From this we we can form a hypothesis that the soil has a good enough stock of nutritions needed to produce crops without the use of fertilizer, and that these change into usable nutrition when stimulated in a certain way. We can assume that the factors below influence this, but we have yet to reach a final conclusion. We know that plants excrete from their roots acids like glucide, citric acid (citric acrid break down phosphoric acid), a wide variety of amino acids, biotin (VB7), alkaloid, enzyme, and phytohormones. Plants and microorganisms supply nutrients to each other, as they create the environment of the soil. So, we can say that growth of plants is also proportionate with the amount and quality of roots. What is more, carbon dioxide which is needed for a plant to breathe becomes carbonic acid, and breaks down minerals. But applying too much fertilizer will cause significant amount of root losses, and the plant will lose strength. If we, humans, for an extended time take supplements etc. to treat disease and maintain good health, we will lose the power to absorb and create nutrients. And also lose the power to build up our natural immune system. Our natural healing ability and physical strength will also all weaken. In the same way, if crops are fertilized, they lose their original functions. Again, trees in the forest and native grasses (weeds) grow to maturity without being given nutrition. Even garden trees which get no energy from fallen leaves still grow strong without fertilizers. We still don’t know why this happens. In Natural Farming, we don't give micronutrients for fertilization purposes. But even so, crops show no sign of lacking micronutrients (Of course at the stage where the Natural Farming method is fully implemented). Even in conventional farming, there are cases where giving minerals to crops with mineral deficiency has no results. We believe that many farmers have had this experience. This too, still remains unexplained by modern science. Performing chemical analysis of the nutritional value in crops gives us no clear and uniform answers. Chemical analysis like this also costs a lot of money, so the number of cases we can analyze are also limited. In recent days, “anti-oxidant potential” is getting a lot of attention. A movement aimed at displaying this anti-oxidant potential on foodstuffs has already started in the United States. In Japan, the AOU (Antioxidant Unit), which many food companies in Japan are members, is working to make a uniform international standard. The number of Natural Farmers are increasing. Some farmers succeed, and some farmers don't. Some farmers encounter problems but keep trying. They are all in different situations. We think that if you have observation skills, patience, will to work hard, and can share and exchange experiences with other people, you will succeed. More than anything, continuance is important. At first, it is better to start with a small area to avoid sudden influences to operation of your farm, and then slowly expand. After about 5 years you will see clear results. It is also very important to continue self-seed production. Many people give up producing their own seeds within 3 years. The main reason for this is that the seeds all vary in quality. The reasons that true breed seeds are not widely used anymore is because of their general weak disease resistance, small yield, lack of adaptability for heavy fertilizing, and bad taste. The important thing to remember is that not all true breed seeds are good. You have to continue the production and selection process to grow good seeds. It seems to take especially long time to make the shift to Natural Farming in fields which have been fertilized with immature compost (especially animal fertilizer and bark compost). Let’s learn from other Natural Farmers when dealing with these problems. The taste of Natural Farming products are not as strong as organic foods. They taste slightly sweetish, and are characterized by refreshing and pleasant aftertaste. 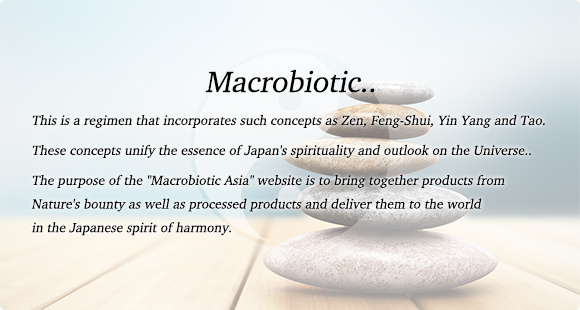 They are also easily absorbed into the body. The concept of ‘good vegetables = sweet vegetables’ have long been around, but Natural Farming differs slightly from this simple way of thinking. We often experience that leftover crops from conventional farming rot and give off a bad smell. But when you think about it, isn’t this strange? Weeds that have been cut down don't rot in this way (The high C/N ratio of weeds might be one reason, but there seems to be more reasons than just this). If you pull up and leave a Japanese radish grown by Natural Farming, most of them simply dry up and become sun-dried Japanese radish. Of course, this is the normal state of things, but in these days we don’t see much of this anymore. Let’s do a "decay experiment". We put one cucumber from conventional farming, and a Natural Farming cucumber in two separate glass jars, close the lids, and observe them. A conventionally farmed cucumber decays and loses shape in a few weeks. It also gives off a terrible smell. But on the other hand, the Natural Farming cucumber keeps its shape better, doesn't decay, but instead ferments. When you open the glass jar again, it smells sweet as a Japanese pickle. 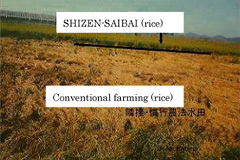 The growth process and characteristics of crops in Natural Farming is of course different from conventional farming. In particular, most crops in Natural Farming are characterized by a very slow initial growth (This may not apply to all cases). But this only applies to the plant parts above ground. We gather that crops use this time to grown their roots underground. The color of Natural Farming leaves often have a slightly faint color. This is just because the cuticle layer of the leaf is thick. However, cooked in boiling water, it turns into a very fresh and vivid color. You may get the impression that Natural Farming crops are weak because the faint color of the leaf. But, you can also say that the natural Natural Farming color nurses our heart and soul. Basically, if the color of the leafs are darker than the color of weeds growing by the side of a field, it might mean that you are over-fertilizing (this of course, depends on the type of crop). 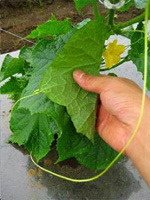 If you perform simple soil analysis, or observe cucumber leaves you will see that the leaves of conventional farming cucumbers wilts during hot daylight hours and recovers after sunset. This is opposite with cucumbers grown with Natural Farming. It catches enough light during daylight and wilts after sunset. As you might know, plants change their physiology from photosynthesis to respiration after sunset. Therefore, getting enough sunlight during the day should be considered most natural. The number of Natural Farmers is gradually increasing and understanding of Natural Farming is also spreading. We really feel that interest from both farmers and consumers is rising rapidly. We estimate that Natural Farming will spread even faster than what it took for organic farming to acknowledged in the world. Farmers using large amounts of fertilizer already know that they are putting a heavy burden on both environment and people, and it is therefore natural for them to try and find a way out of this. We believe Natural Farming is this way. Japan doesn’t originally have a food culture centered around meat and dairy products (Originally cereal/grain based). But if Japan today and other countries like it decided to change their meat eating habits we could feed all the mouths in the world with the current agricultural production. That is because to produce 1 kg beef, 8 kg of corn is required. There are also countries that eat this corn as their staple food. 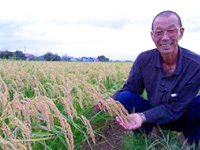 Japan began importing “sorghum bicolor”, which is the staple food of Sudan, for cow feed　in 1993. Japan actually plunders food from poor countries by the power of their money. Most Japanese eat meat without knowing anything about this. The reality is that one person dies of hunger every five seconds, and numerous people suffer the effects of environmental destruction. Isn't this problem too serious for people to simply brush it off saying that they didn’t know? Moreover, as cows, pigs and chickens are all living beings they excrete waste. The amount of this is enormous. In Japan, livestock excretion holds a 2nd place among amounts of industrial waste processed, and the amount was as much as 89 million tons in 2003. The amount of products produced in the United States is about 8 million tons a year. In short, the amount animal manure in one year is 10 times higher than this! Processing this waste is also a big problem. 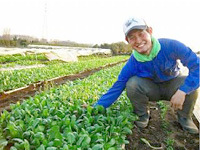 Currently JA (Japan Agricultural Cooperatives) receives subsidies from the government to establish compost centers in various places, and then sell it to farmers. In addition, some cattle farmers transfer unprocessed excreta directly to agricultural farmers to cut costs, and they use it on the field as it is. This ignorance is nothing but scary. Sludge hold the 1st place for waste processed in Japan. This is actually sometimes made into organic fertilizer and sold in the name of “recycling”. It is widely used. Some farmers use 1-2 tons per 10a, and some as much as 20 tons. This decreases feed given to livestock, so that people in the third world can keep and eat their staple foods. If the production of livestock decreases, grain will be in surplus. The need for cultivated land decreases, and so does the amount of the fertilizer used. 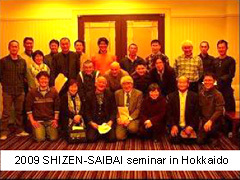 The problem in Japan with the enormous amount of industrial waste from animal excreta is solved. The nitric acid problem is solved. We become healthier and happier humans! War and conflicts also decrease! It is said that we are living in an information society, but even if we see an image on TV of a child suffering from hunger, we don’t notice that we ourselves are partly responsible. It's a simple calculation. If you eat 200g of meat, 1.6 kg of grain is consumed. Reducing meat consumption can give us the chance to change the tragic reality of one person dying from hunger every five seconds. Excessive meat consumption has a broad effect on our health, our environment and also on the innocent people of third world countries. Let’s decrease the amount of meat we eat little by little! on pesticide or fertilizer, neither chemical nor organic. without receiving any artificial nutrition from humans. harvests without the need to use pesticides or fertilizers. these seeds are full of life and blessed by Mother Nature itself. amazement and happiness of their fantastic taste. 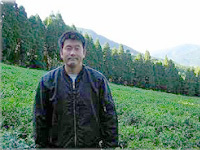 There are many farmers all over Japan who grow superb products using methods other than Natural Farming. We can see that they are people of solid character, and that they have respect for nature. You can actually feel the influence of a farmer's mind and heart in the product. 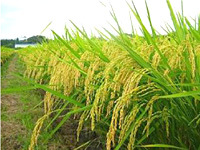 It is often said that the sound of footsteps is the best fertilizer for a rice field. We don’t say this in an idealistic way, or to flatter, but the farmland is a place that cultivates life. If you can face this conception of life head on, your way of thinking might very well change. There are many people like this among farmers who practice Natural Farming. I say we can draw the following conclusion: “Listen to your heart”. We believe that excessive use of fertilizer is "non-sustainable" seen from all angles, be it health, environment, society or politics. Because we believe that, decreasing fertilizer use, ultimately not using it at all, as well as self seed-production leads to a "sustainable" society. We often hear the words "for the sake Earth" or "conserve the environment". However I have never been able to really identify with the concept “for Earth”. Because even if mankind becomes extinct in the near future, Earth will still go on existing. This phrase doesn’t mean "for Earth", it really means "for mankind". If we want to survive, we need to start seeing things in from a more comprehensive and objective point of view. It is only natural that nature is far more powerful than we are, as we are a only a small part of it. Therefore, we should modestly observe nature, and do our best to find ways to act according to it’s will. 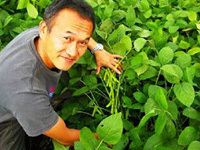 You might now be convinced that it is possible to grow enough crops without using fertilizer, but as I mentioned earlier, Natural Farming is not like non-interference methods, it is a method requiring a high level of knowledge and technique. Until we get to that point, we have to always stop and listen to what Mother Nature is trying to tell us. That issue might never go away. Natural Farming is not a theory you can learn from just reading books, you need to go into the field to seek the truth. At the present time, crops from Natural Farming are still rare, so we can't have products in stores all year around. However, the demand of each and every customer is directly connected to expansion of the supply. Which in its turn, connects to building a sustainable society. When we buy products made with Natural Farming and experience how delicious they are, we can also know that we are involved in the conservation of a healthy earth that we can proudly pass on to our children. This feeling is the same whether you are a producer, a distributor, a retailer or a consumer. These connections leads to a sustainable environment, a deeper connection to life, and in the end, to real richness for mankind. We, Sun Smile Co. Ltd., approve and stipulate farming to be “Natural Farming”, and crops to be a “Natural Farming agricultural product”, under the following circumstances: Agricultural chemicals, chemical fertilizer, organic fertilizer for fertilization purposes are NOT used. 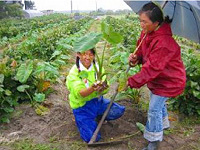 The cultivation is sustainable and long-term. 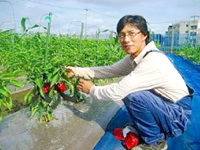 On basis of cultivation records, contracts with producers and inspection by our company. ※１）The definition of "fertilizer" is based on Fertilizer Control Act). In this law, "pesticide" is defined as sterilizer, insecticide and other medicines used to control germs, eelworm, tick, insect, rat and other flora, animals or viruses that impair farm products. Also growth promoters, sprout inhibitors and other medicines used to improve or to control the physiology functions of farm products. Vegetables that have grown by the blessing of Mother Nature are full of life, and makes you realize what true taste and happiness is.